Roof terrace overlooking the river and the gardens. Situated on the northern end of Bangtao beach, Villa Samorna is a villa with a view of the river and holds a private pool and huge garden on Bangtao Bay. Large and charming with a Balinese style, this villa holds four ensuite double bedrooms, so therefore has the capabilities of sleeping up to 8 people comfortably. The layout of this villa is unique and very practical, with the four bedrooms spread out over two wings of the house, and are then connected by a roof terrace. This makes Villa Samorna ideal for two small families, as each wing has a separate staircase. Furthermore, the scenic views and tropical experiences with the bird life, garden and nearby hills will intrigue children and adults alike. 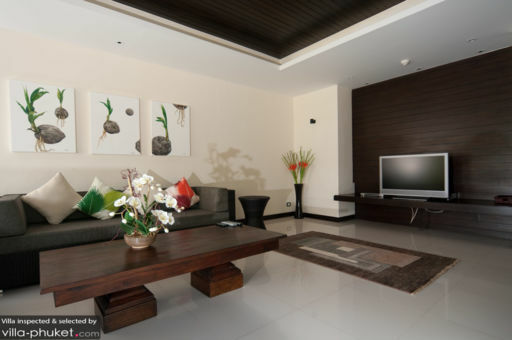 Two of the bedrooms can also be arranged as twin bedrooms. For those that are not wishing to climb the stairs, there is study on the ground floor with broadband internet and a wireless router, which can also be converted into a spare bedroom. Entertainment, luxury, and leisure is all possible indoor and outdoor no matter the weather. 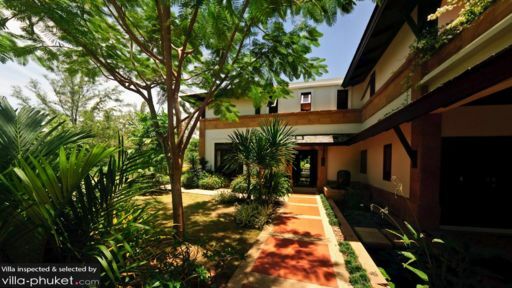 Situated on half an acre of landscaped garden, bordering a small river that runs into the Andaman Sea. A lotus pond and a water feature also lead to the front of the villa. Beyond this are ample terraces, the swimming pool, the adjacent outdoor pool sala with loungers, as well as the extensive lawn. With such tranquil surroundings, Villa Samorna is sure to provide you with a serene holiday for all ages.